Love football and Ben 10 both? If yes, then you’re gonna definitely love the Ben 10 Penalty Power game. The Hex has captivated the whole football stadium and Ben has to rescue the lives of thousands of people. Only if Ben defeats Hex in the penalty shootout, Hex would leave the stadium leaving are the people unharmed. Before you go kicking the ball, check out some important gameplay details below. Grandpa Max, Gwen and Ben went to see a football game. But, to their surprise Hex reaches there in search of Gwen and captures the whole stadium inside his red energy dome. There is no one except Ben who can save the lives of thousands of people and the battle is football match itself. The Ben 10 Penalty Power game is actually a penalty shootout of Hex’s team vs Ben 10 aliens. Hex has in his team while Ben has the Ultimate XLR8, Cannonbolt, Four Arms, Heatblast and Diamondhead. Recommended: Want to play more ben 10 games? Check out the exciting Ben 10 Alien Force games right now! The game play is exactly like a real football penalty shootout. You have to play against Hex’s team in five rounds. In each round you get 45 seconds to score goals and next 45 seconds to defend the goals. Use the mouse to kick the ball or move your goalie across the goalpost to defend. Your task is to score as many goals in the given time and then save as many goals of the enemy. You must win each round to move to the next round. You must choose your players wisely because the Ben 10 Penalty power needs a good strategy to win against the powerful team of Hex. If you loose any penalty shootout round, the game will restart and you have to play that round again. It game time guys! Kick the football through the net and make sure Hex does not score better than you to win! 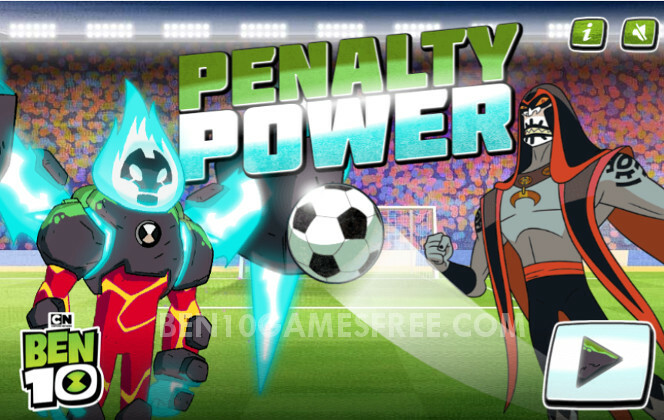 Don’t Forget to give your rating for Ben 10 Penalty Power game and share your tips and tricks to win this game in the comments section below.